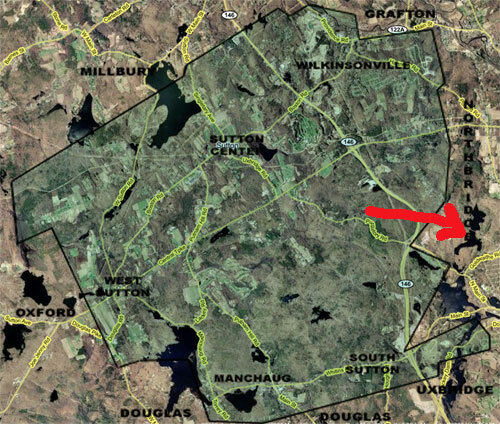 The Carpenter Reservoir is technically located in Whitinsville MA. Whitinsville is an area of Northbridge. However, when you look at the map of Sutton's boundaries, you see that this clearly should belong to Sutton :) It's only because Northbridge / Whitinsville "dug in" to Sutton that they got their hands on this lovely kayaking spot. It's time for us to reclaim our water! 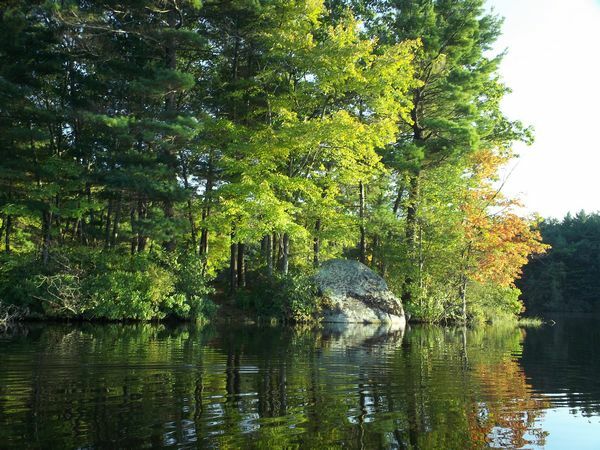 But while we're planning for that little take-over effort, it's foliage season and the Carpenter Reservoir is a perfect spot to kayak. We went out on October 7, 2011 to see how the foliage was doing. Things are still quiet in foliage land in Sutton. There are a few trees turning colors, but most are still solidly green. Here's the link to the full set of photos from our afternoon of kayaking on the Carpenter Reservoir. There were MANY flocks of Canada Geese streaming south over head, one after another. Some flocks would even merge together into collosal flocks right over our heads. It was a gorgeous day to be on the water, and a perfect autumn experience. On this visit to Carpenter we went out of the put-in spot immediately adjacent to the parking lot, exploring the northern half of the reservoir. The reservoir is cut in half by the road. Lucky trip #7 on my new kayak!